You have to find a food you ate, then log it to your diary. Food Search and Barcode Scanner are the most common ways to do this. You can also create your own Custom Foods and Recipes. Another way is to pick a food from one of My Foods lists collecting your favorites as well as any previously logged foods. Instant Food Search finds matching foods immediately after you start typing food name. 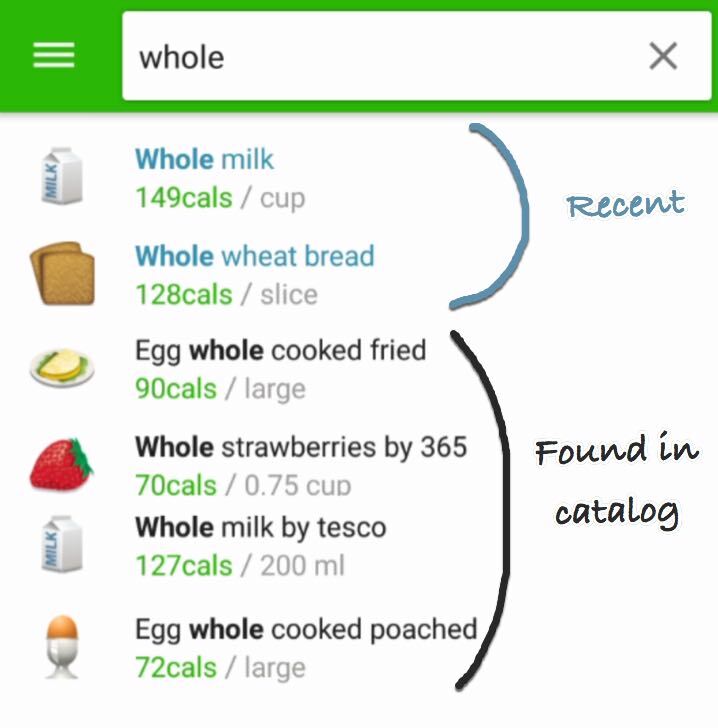 It shows the most popular foods and your recently logged foods at the top. The rest of this page describes techniques of effective food search. Tip 1: Type in restaurant, brand or vendor name to narrow down your search. Tip 2: Type the words in any order. Tip 3: Try typing beginning of the words, e.g. pea yog gree input brings up all kinds of Greek peach yogurt. Type at least 3 first letters from every significant word in food name. To quickly find a fresh fruit or vegetable, simply add the word raw to your fruit or vegetable, e.g. raw orange. Another special word is cooked, which can be added to vegetables, meats etc. Tips for Finding Food article helps finding fruit, veggies, meats, fish/seafood, poultry, grains and pasta (and their cooked variations). MyNetDiary remembers short food name as you entered it and shows your short food name instead of full catalog name. For example, the screenshot above shows Whole Milk, which is user’s short name for the full name Milk whole 3.25% milkfat. You will also see recent foods with short names in My Foods collections. Tip: If you don’t want to see some of your recents at the top of search results, select Remove from Search History menu item in My Foods. When you don’t find a food in the catalog, create Custom Food or Recipe. Tip: If you don’t have Nutrition Facts for your custom food or recipe ingredient, search the web while adding calories in to food name. For, example, see the results for calories in summer squash.